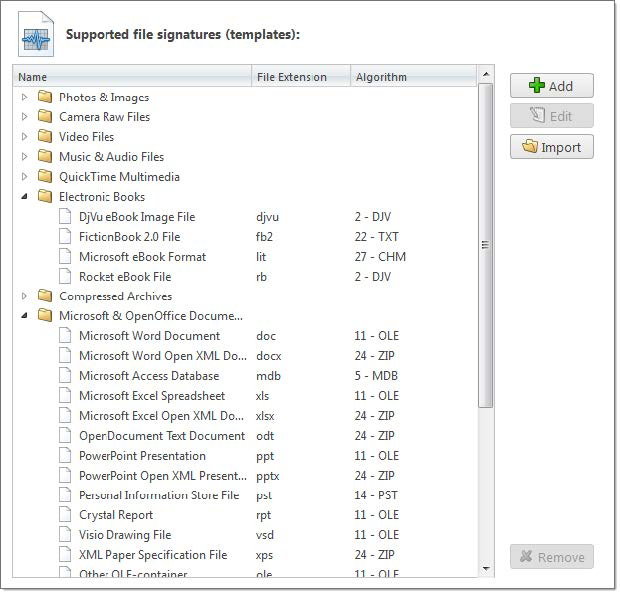 Active@ UNDELETE comes with more than fifty predefined (internally programmed, very fast) file signatures to be used to detect particular files (MS Office Documents, many Image formats, ZIP archives, MP3, etc. during disk scan. However sometimes advanced users need to detect more specific file formats, not being defined in default signatures set. For that purpose — custom file signature can be defined by defining file beginning and file length criteria. See Custom (user defined) file signature templates for details. Active@ UNDELETE offers advanced tools to define user's templates for signatures to be analyzed. 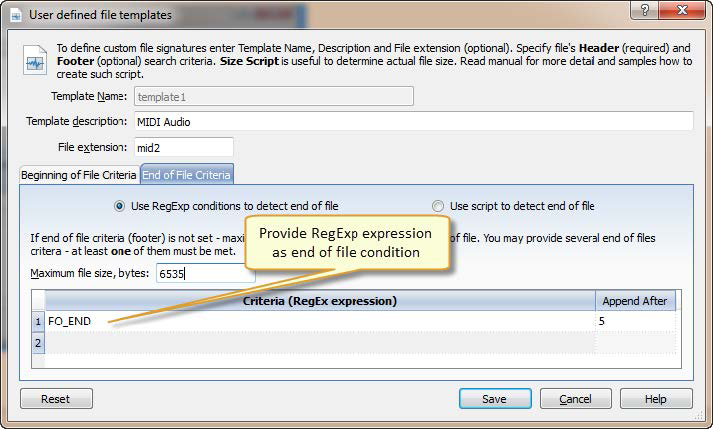 Signatures can be defined using extended definition language RegExp (Regular Expressions). Click Add button to define new custom file signature. Click Import button to load (import) custom file signature from script file (*.ini format). See Custom file signature size script for details. Note: You can edit your custom file signature template at any time by selecting your template in list and clicking Edit button or simply double-clicking on template's name. Use Edit file signature template dialog to define starting signature criteria ans file length (file end) criteria of signature template. Provide template name and brief description — for future references. Specify file extension of a file type you defining (optional). 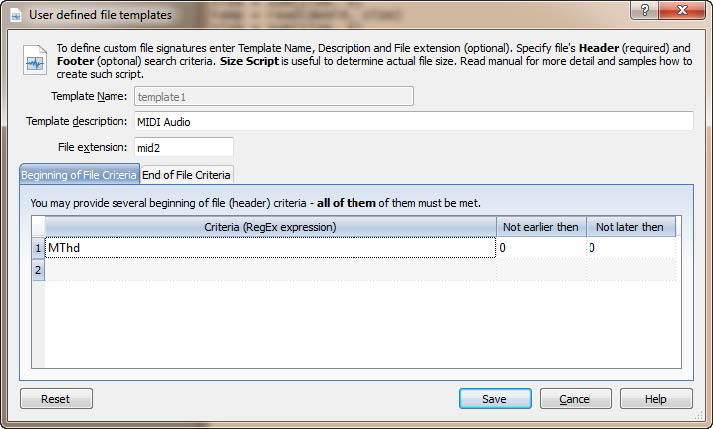 To completely define custom file signature template you need to enter Header (beginning of the file) and Footer (end of the file) criteria using RegExp syntax. Header criteria could be more then one and all of them must be met to consider beginning of the file. Footer's criteria could more then one too, but at least one of them must be met to consider end of file. List of RegEx criteria, considered as beginning of file combined as AND statements. Not earlier then and Not later then specifies limits of defined criteria in the beginning of a file template. 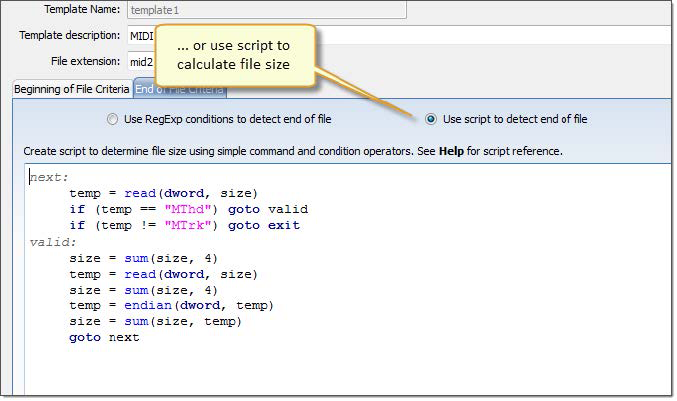 By list of RegEx criteria, considered as end of file combined as OR statements. In case of missing file footer criteria, end of file will be taken by defined Maximum file size. Append after attribute specifies size of end of a file. File size is used in case of missing file end criteria. By default its 65535 bytes. By using simple script to calculate end of file. See Custom file signature size script for reference. Defined custom file signatures templates are stored in INI files in user's selected locations and will be loaded at every consequent application starts. You can also import such custom signature template files created by other users by clicking Import button and specifying full path to custom file signatures template file in opened dialog. See Custom file signature size script for details. Note: Also you can specify Custom File signature template from Volume (logical Drive) Scan dialog or Disk Scan dialog by clicking Add button near file signatures list. Important: Regular Expressions can be used while defining signature headers and footers. Please check RegExp syntax on a web for examples . Custom signatures file size calculation syntax. TEMPLATE### — points to the section where signature template is described (numbered from one). Note: If field SCRIPT is present, then field FOOTER is ignored in template header section. Note: If there are several fields listed in signature beginning, logical AND operation applied to confirm file start. Note: If there are several fields listed in signature, logical OR operation applied to define file end.